Oh, Kenya, Kenya, Kenya. I don’t know why it’s taken me so long to come back here, ‘cause your coffees are delicious and your land is beautiful. Maybe it was the Nairobi traffic that put me off, cause in all fairness, it’s still atrocious! But in spite of spending yesterday green with food poisoning (thanks Virgin Atlantic) I couldn’t be happier to be back during a very interesting year for Kenyan coffees, with the harvest being the biggest they’ve seen in a good few years; more than double of last year. 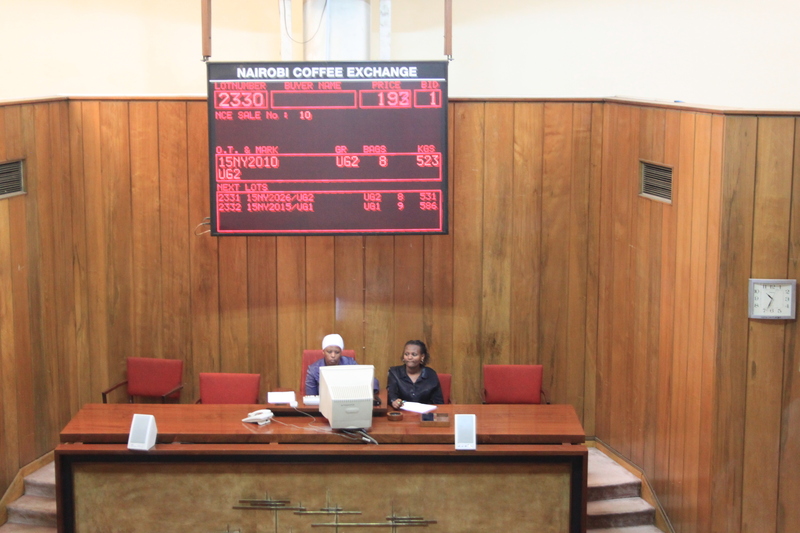 Last year prices were also through the roof with very little coffee available and a C at dizzying heights, but this year the C is settling back down a bit and with cherry supply so rich; the farmers’ expectations of even better prices this crop is unrealistic and a hard expectation to manage for the marketing agents. 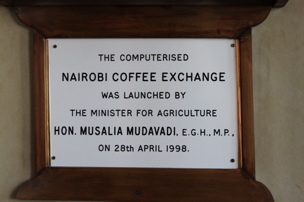 The system in Kenya is unlike most countries in that the majority of coffee is sold via auction, although there is a second window open for buying outside of this platform should you want to/be able to. 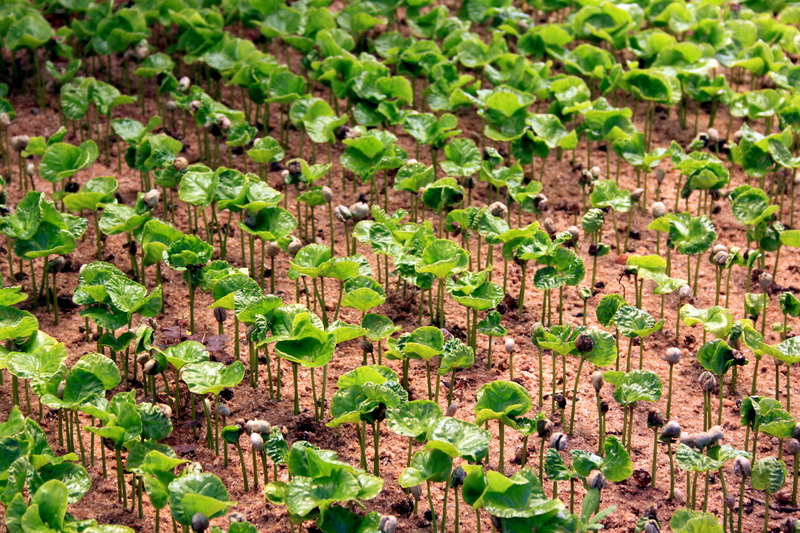 Growers are typically small with shambas of 0.5 to 1 hectares and perhaps as little as 50 trees each, so they pool their coffee together at their local factories; wet mills that buy the cherry and process it to exportable parchment, then sell it via marketing agents to exporters. 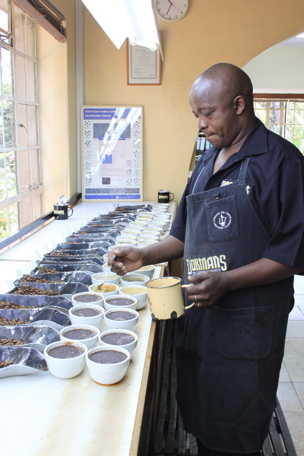 The first day of cupping was spent with Dormans who have helped us find and bring in many of our favourite Kenyas over the years. I’m traveling with Ben from San Francisco and Mie from Vancouver, and having sent through a wishlist of coffees to try before arrival we got straight to it alongside the wonderful Bridget, Kennedy and Daniel. 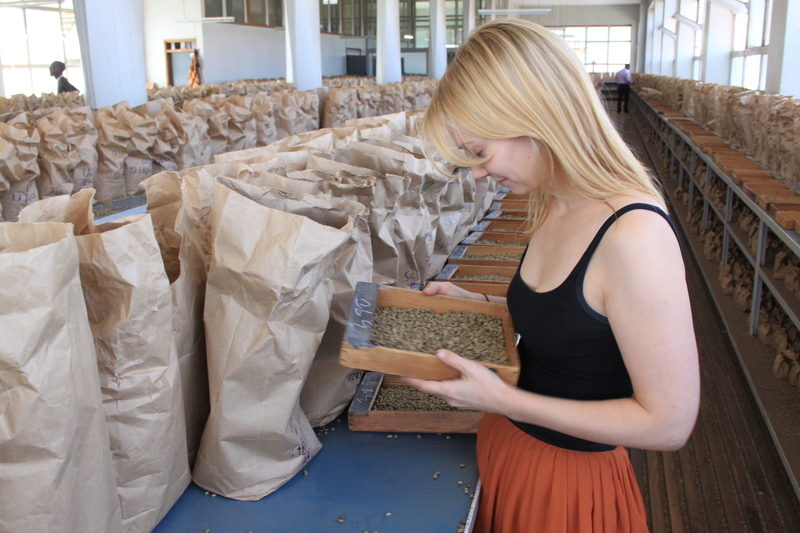 Amidst the 4-500+ samples they cup every day just checking auction samples, arrivals and stock, you feel quite daunted by the speed and palate fatigue about to conspire against you while people like Bridget breeze in and out sipping through the cups calling out scores. It’s pretty full on but the lab is set up to run like clockwork, led by John and Dixon in charge of each their 5 and 4 barrel Probat sample roaster, churning out impressively precise and consistent roast levels. I panic if I have to run more than 2 of my 5 barrels at a time, so someone like John, who now close to retiring has been doing this for over 30 years, really makes me want to do better. I’m not sure I could ever do what the cupping team does every day though, the acidic coffees just dry out your tastebuds so fast- taking breaks have never been so needed and effective. 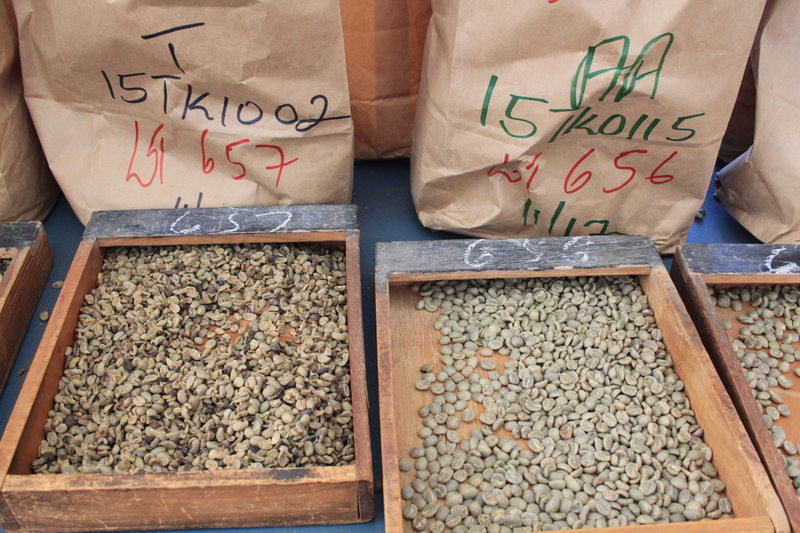 Before they even get to the roasting you have Wilson checking every sample of green that come in from the warehouses, screening 100 grams to find out if the bean sizes really are what they say on the bag. I had a little go myself and to my surprise one of the samples being marketed as a AA, only contained 40% beans at screen 18+, the rest being a manky mix of small beans, shells and debris. This is not to say that that 40% of actual AA would not be delicious, but you have to leverage your price if bidding on a lot like this to reflect the fact that once you’ve cleaned it up at your own mill you’re left with more than half of the lot unsellable at AA prices. Along the wall of windows looking out onto the lush gardens at Dorman, Sam and his crew will line up sections of 15-20 coffees at a time, two bowls of each sample holding 16 grams of coffee, pour the cups half full, steep them for 4 minutes before giving them a quick stir and then top up with more water. After a skim and a wait till they’ve cooled, you cup and give your verdict, while the next flight of coffees is already steeping further down the table. And so it goes in stages, a constant circle of coffees roasting, grinding, brewing, cooling and cupping. There is no 24 hour rest after roasting, no sniffing of the grounds or the break, no cupping from hot through to cool, no elaborate note taking and deliberating over half points. While I tried to note down as quickly as I could what flavours I could find and what I might use the lot for, Bridget would frequently overtake me calling out her scores of 323, 233, 232/2, 223/4 and so on, to the assistant closely following her and writing the results into the auction catalogue. Given that 111’s are apparently a bit like unicorns, what we’d be hoping to find would be 222’s at best, and I was very excited to see what we’d get out of a sample of a recent delivery of Tegu which was on one of the tables in AA, AB as well as PB screenings. But it became apparent across this and many other factory lots that the AA’s aren’t really that popping this year and that the AB selections in many cases are as good or even better. There might be many reasons for this, an unusual growing cycle and large crop depleting or abnormally distributing nutrients, facilities at factories and mills struggling with the volumes causing less than ideal drying and storing conditions being two that I feel there must be most validity to. 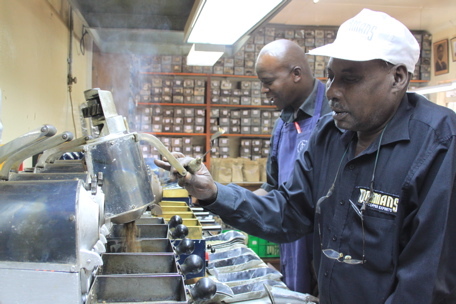 After a brief lunch with Chris and Teya and a run down on the Dorman cafes remodeling plans, we returned for more cupping and a chat about Dorman’s plans for moving into other African countries, all which sounds very exciting and will be great to follow closely in the years to come. Each marketing agent has their slot in the day and the order rotates from week to week. 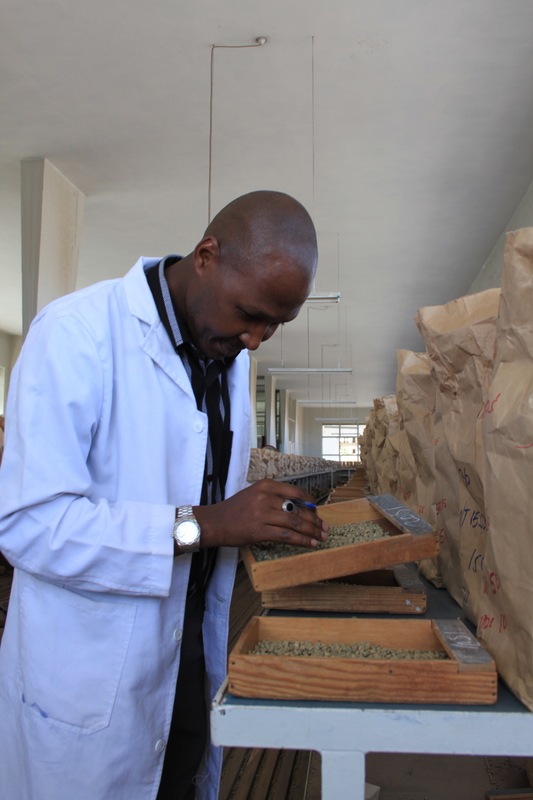 Each marketing agent may also have any grade from AA through AB, PB, C, T, TT, UG or UG1 to sell (that’s for washed coffees, naturals are sold as MH- Mbuni Heavy and ML- Mbuni Light) so if you’re only interested in AA lots, but from several marketing agents, you quickly end up spending full days at the auction waiting for your lots to come up. I’m told it’s wise to pack a lunch and perhaps bring some magazines if you know you’re in for a long one, but even if you’re not actively bidding yourself- many traders will follow closely what everyone else is buying and what prices they go for, taking full advantage of the transparency this system offers. 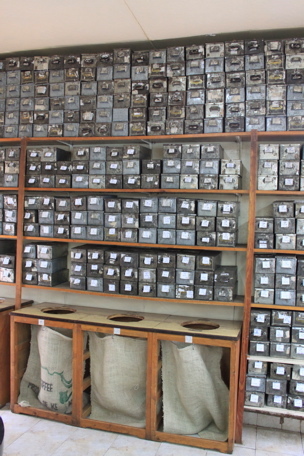 While the auction room might not be the most thrilling place to sit and watch for hours on end, you could always go up to the sample room where they keep the bags of 21 kg green the mills send down every week via their marketing agents. 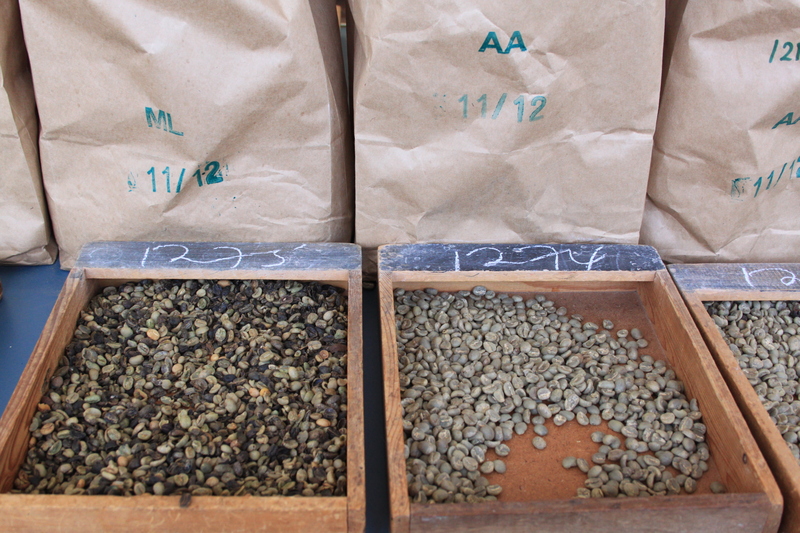 They will also cup these samples and give some indication to the farmers on what prices hey should expect. 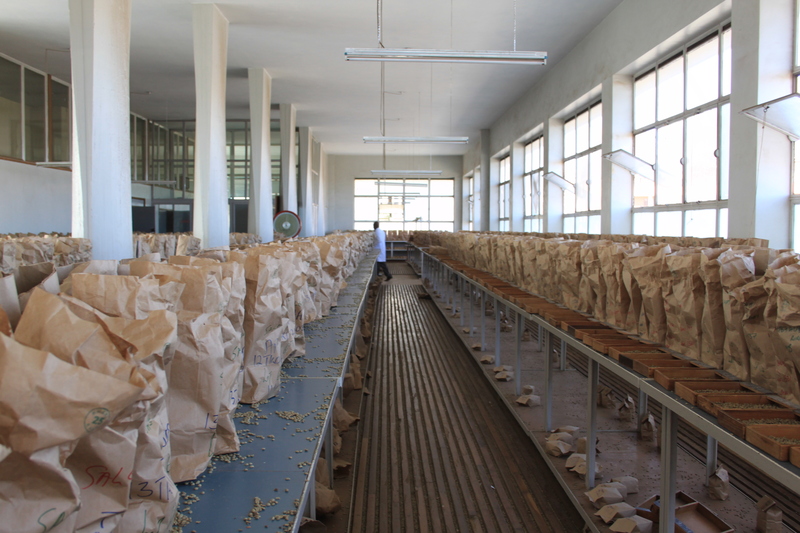 The regular exporters can then each get 200g of these samples for their evaluations, and 160g are retained by the mill for reference in any arbitrations that might pop up after sale. 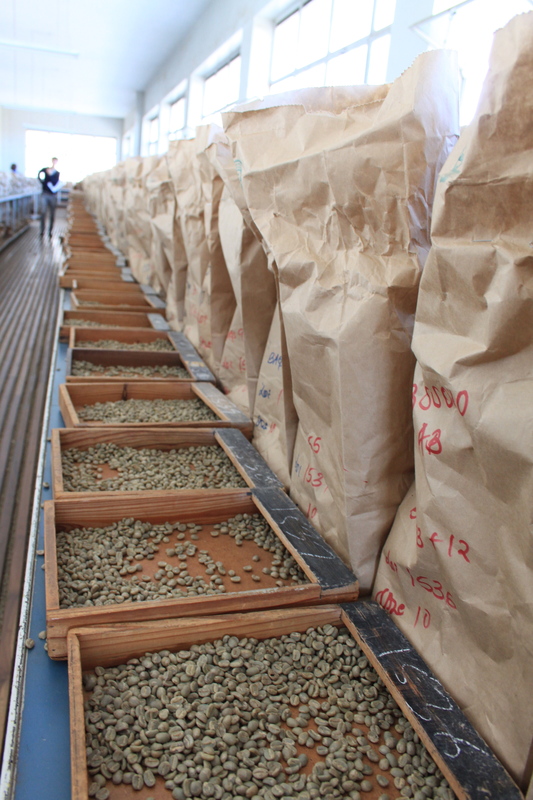 After the auction is done, the winning exporter can go get another 500g to take back for further cupping and distribution to potential end buyers. The benches and shelves of brown paper bags with outturn numbers, grade descriptors and lot size indications scribbled on them seemed to go on for miles in this place. In front of each bag a small tray with some of the contents is places so that any exporters can easily inspect the lots if needed. 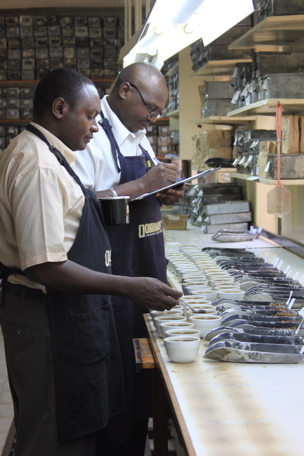 Macharia, who was prepping some trays as we arrived, gave me an auction catalogue and took me through some of the various grades to be found- it’s quite the contrast when you see AA’s and T’s or ML’s displayed next to eachother. 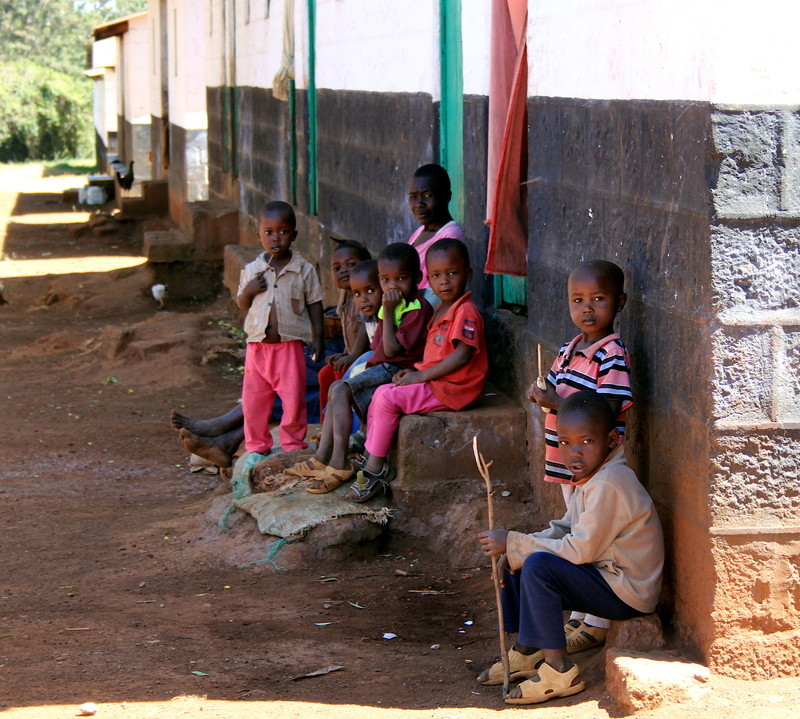 Today we also drove north towards Nyeri to visit the Central Kenya Coffee Mill, slowly creeping out of Nairobi in the middle of the horrendous Nairobi-Thika highway roadworks, burning rubber and rubbish along the wayside and trucks, motorcycles and fully stuffed mutatus making up traffic rules and lanes as they went along. Once into busy Zimmerman it got a bit more peaceful, burning scrap making way to furniture makers creating and selling their pieces, stalls overflowing with fruits and vegetables, building materials of every sort on offer and people seeking shade from the hot midday sun. Where the road has not yet been paved you drive through belts where the 10 meters of greenery on either side of the road is just covered in the red dust from the soil, and you have contrasts like huge apartment complexes being constructed across the road form fields of produce where women are hunched over in the scorching heat weeding and tending to their crops. The first stop on the way was the CMS managed Yadini Estate near Ruiru, a fun looking little town where music playing on streetcorners and shops called things like ‘The Pork Place’ instantly made me take a liking to it. 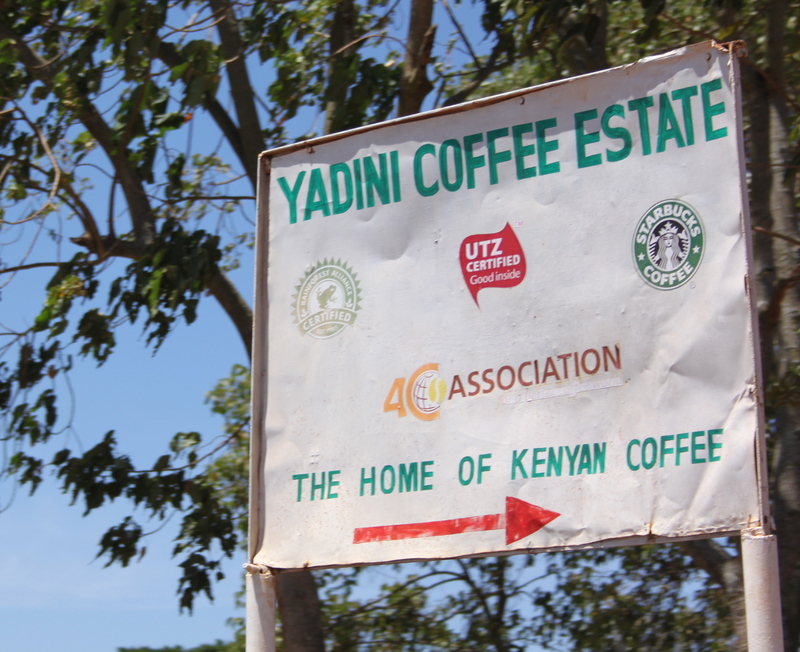 Yadini was established in the early 1920’s and has 27 sections across 83 hectares, 7 of the plots SL, the rest Ruiru11 and a Batian plot in planning. 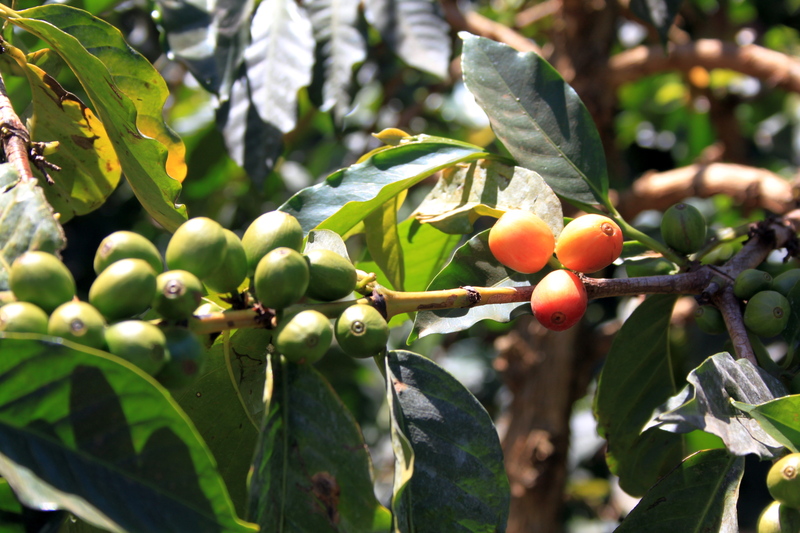 Batian is a variety that was released in 2010, developed to have much the same resistance to pests as the Ruiru11 from 1985, but to cup at a quality more like the SL’s- and yield well of course. I’m wondering if I’ll be able to cup any on this trip, I’m generally careful about getting too excited or too skeptical about this sort of thing, but I’m always open to cup. At Yadini we were greeted by their agronomist Hezron who guided us through a small section of the estate, explaining about their work. 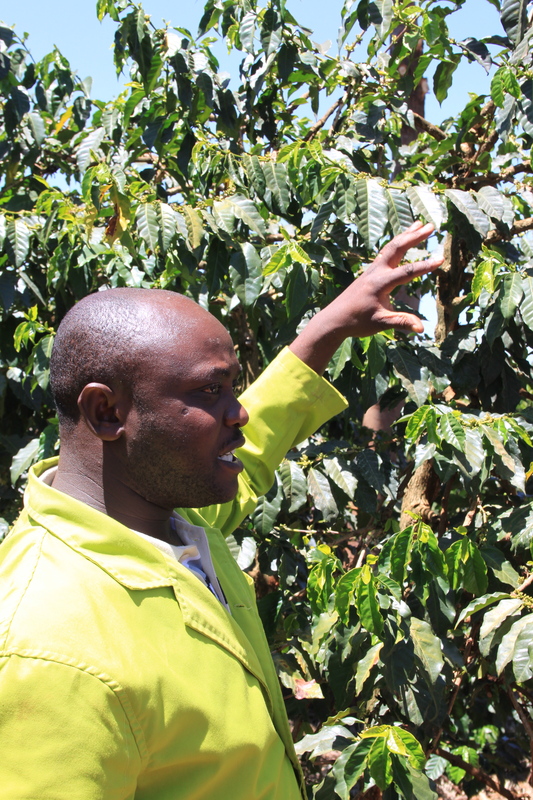 He filled us in on their tight routines in using fertilizers and fungicides, with leaf rust and coffee berry disease being the two main threats to the Kenyan coffee stocks. We also see some trees affected by berry moth, turning cherries black on the branch. Magnesium, lime, nitrogen, phosphorous, potassium etc is used to add the needed nutrients, and dug out divets between trees and rows ensure water can be retained and leaves and cuttings slowly compost. Bluegrass is grown betweeen rows helping to prevent erosion but also providing organic material. The murram soil here is so different from the spungy, soft, green carpets of undergrowth you see in many other countries, it’s so hard and barren, dusty and dry, it’s not hard to see why they need to invest a lot of money into fertilizers here. But the trees all look healthy and strong, capped at 6 feet tall as this is how high the arm on the tractor spraying fungicides will go, and of course it makes it easier to pick the top of the trees without having to use ladders. 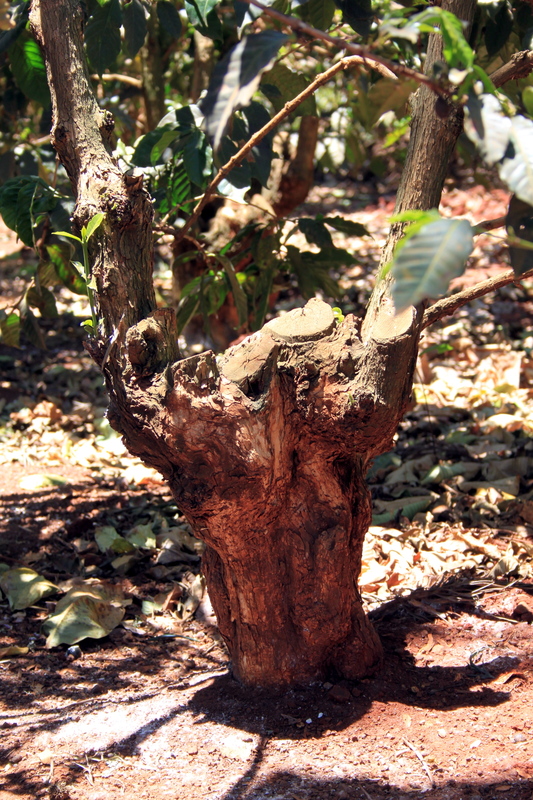 Some of the trees on this farm have absolutely massive trunks at the base, very old root systems that have expanded over the years as pruning has kept the upwards growth young for carrying good yields. The practice of stumping here is done differently for the Ruiru and the SL, as one has a denser growth than the other and benefits more from better access to sunlight. For the Ruirus, two main mama trunks are kept on the tree. At 7 years, one of them is stumped, leaving the one mama still producing while 2 new shoots are allowed to develop from the root. After another two years, the old mama is chopped off and the two young branches are allowed to continue on to 7 years, when one of them will be cut, etc etc. 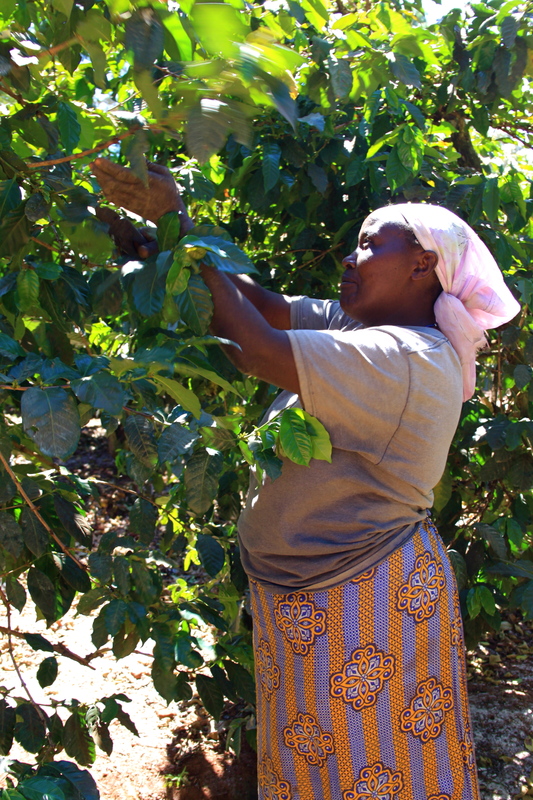 For the SL’s, three mamas are the standard, two being cut at 7 years and three new ones allowed to come up, then at 4-5 years the remaining old mama is cut. 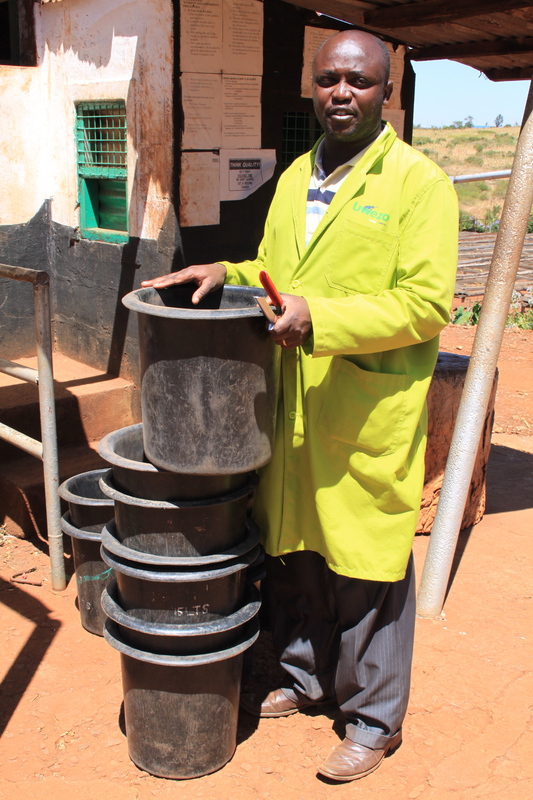 Pruning is a main concern here to keep the yield up, and June is the time when Hezron will know if the pruning has been successful, if the crop is looking to be a good one, and how much money he needs to find in his budget to finance the feed for the needs of his trees. Besides the soil here being different, another thing we’re not seeing much is shade trees. Herzon did feel he had a good number at Yadini, but they were nothing like we’re used to seeing, and certainly too few to be very effective in doing the job they’re supposed to. They also prune these trees from the bottom up, removing the branches that would be doing the shading best in the first place. A lot of these trees are not just grown for shade though, they also get used for timber when they reach a certain height, and so you might have to choose if you want to prioritize shade or the option of another income stream. I feel like there must be a compromise but hey, I don’t know anything about native Kenyan trees so can’t really suggest anything. 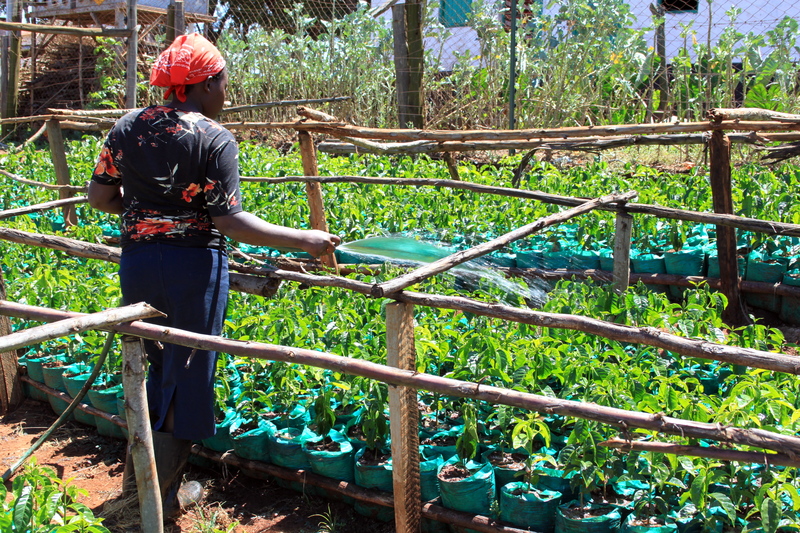 In the nursery we come across the 10 000 Batian seedlings and young trees that are being planted here as well as being sold to neighbouring farms at 30KES/tree. As for other varietals Hezron has some knowledge of the K7, but other then slightly longer branches he considers it similar to the SLs and so not of any use in replanting here. 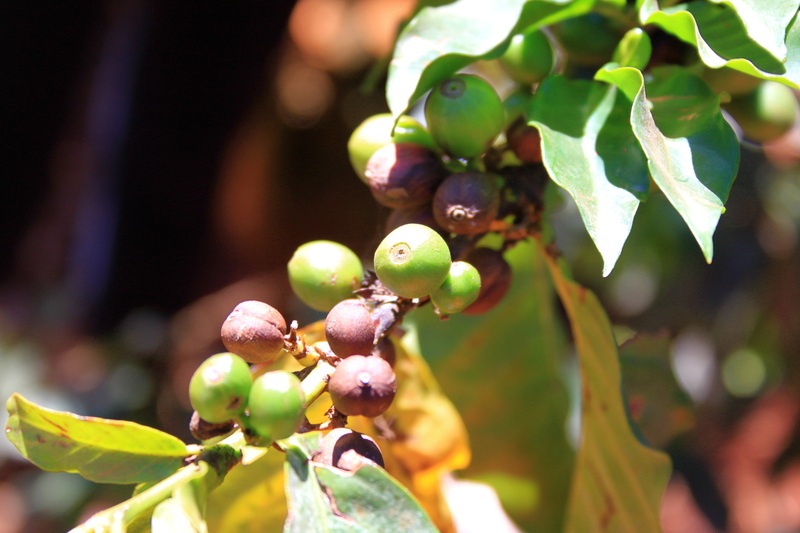 Yield is obviously of key importance and some of the data from the Coffee Research Station in Ruiru show Batian to outperform Ruiru by 0.5 tonnes per hectare. They averaged about 1400kg pr hectare last year, and this year leveled at 2 tonnes/hectare. Pickers are paid 60 schilling per debe, a 20 liter bucket that holds about 14kg of cherry. These are tipped into collection tanks before the full days harvest is pulped, and dry fermented for about 10 hours. After going through the washing channels the parchment is soaked overnight to improve the colour of it, an argument I don’t fully understand the reasoning behind but somehow it has beneficial results on the cup so then I guess we’re all good. This soaking water is changed every 6 hours to avoid over fermentation, and the water is re-used to pulp the next day’s pickings. Once out of the soaking tanks the parchment needs to lose its skin water within a few hours to prevent rotting, and the total drying period would be 6-12 days; weather dependent. If the weather gets too hot they have the option of covering the beds with netting to prevent the parchment from cracking, but down here in Ruiru it’s so hot I’m sure they must struggle to shade it enough at times. 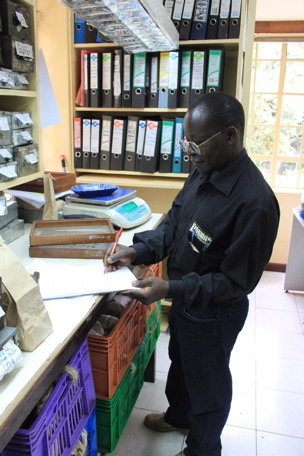 Driving on to Thika we made a brief visit in to see Sustainable Management Services, who represented a few of the coffees we had last year and are doing some in depth and fascinating work out here. 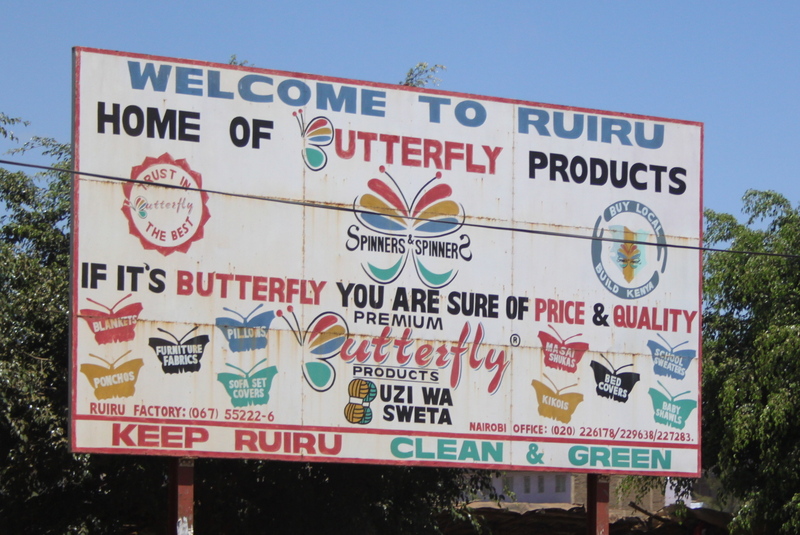 Julius and Charles were very good to see us even if we were an hour late, and still able to give us a great overview of the company structure so that we can cup with them back in Nairobi and have a better idea of how their chain of custody works. With their own dry mill just being finished off now they’ll have a fly crop to test all the logistics before the next full crop comes in, and people are expecting it to be as big as or even bigger than this year. We had a deadline to get to the Serena Mountain Lodge before the park gates closed so Zachary our driver spared no effort in getting us there on time, out of Thika (who refer to themselves as The Birmingham of Kenya!) as school children were being herded along by their teachers, people carrying or ferrying firewood on their bikes to cook dinner with, and taxi motorcycles with three people piled up, blasting music as they rode along grinning and having the best time with it. We hit Karatina at about 5pm, took the obligatory picture of Hotel Starbucks, and continued north to the Mount Kenya National Park. At 2195 masl we pullet up to a beautiful lodge hotel where we were to spend a night just surrounded by trees, animals, and a bunch of safari clad bird watchers. It’s pretty chilly up here so I declined the offer of being woken up in the night should any wildlife come down to the nearby waterhinghole, and after a lovely dinner I’m just pleased to have crawled into bed before nine to find a hot water bottle at the foot end.